The Alexian charism and mission is found expressed in the Alexian crest. The top half of the crest depicts the Pelican feeding her young with her life blood (a popular medieval symbol) representing total self giving and the self-sacrifing imperative Alexians choose in order to serve wholeheartedly those who come to them for spiritual and material sustinence. In the lower half there are two sections: on the left the crossed spades, a rather grim reminder of the burial ministry of the past yet a source of inspiritaion for Brothers currently working with the dying whom they assist with 'hands-on' ministry and counselling. 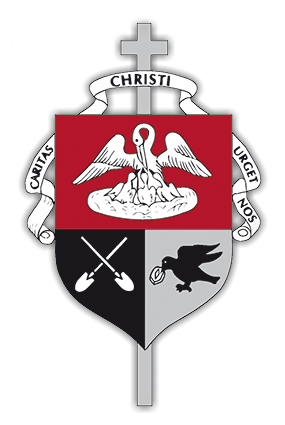 On the section to the right, the raven with bread in its beak is a symbol of trust in Providence and also reminds Alexians of their origins when they begged for bread for the poor. Centrally to the ministry today is feeding the poor spiritually and physically. The cross on which the crest rests is the emblem of dedication to the Alexian mission for the sake of Christ. The Christ who was born, lived and died for us in his faithful mission journey is the same incentive they chose to faithfully dedicate themselves to their mission today. Across the crest is the banner which bears the words which carry the driving force of their charism: 'Caritas Christi Urget Nos', the love of Christ inspires us.